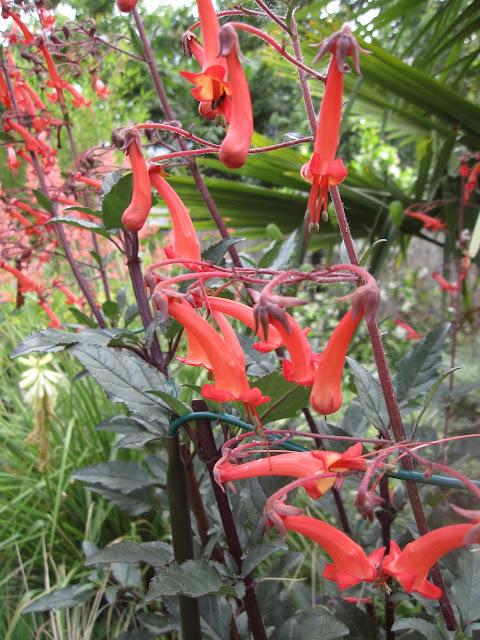 One of the great benefits of membership in the Hardy Plant Society of Oregon is the opportunity to visit the gardens of other members. I've been an HPSO member now for several years, but somehow, inexplicably, I never took advantage of the Open Gardens until a week ago. The Maryellen and Michael McCulloch garden is tucked away in NW Portland on Old Germantown Road. I picked it mostly based on convenience, and it was a bit of a trick even to find. 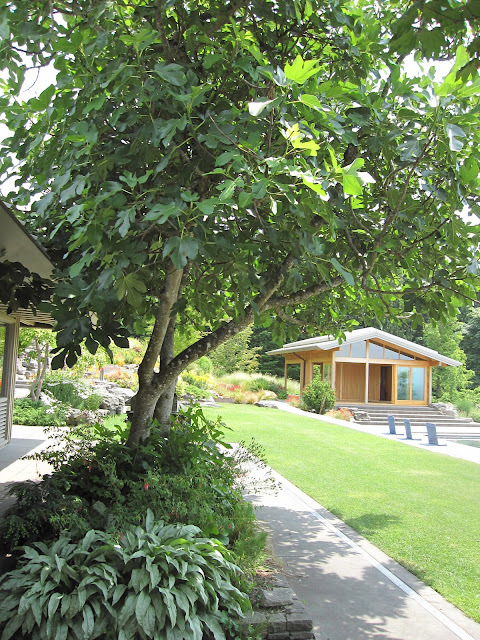 But the visit to this 40-acre property and gardens on a warm July afternoon was the perfect choice for my maiden Open Gardens tour. As I pulled into the parking area, the tone was set with a huge, red, strip-metal ball. I had the place almost to myself, as a pair of visitors were leaving just as I arrived. I noticed they each had plants in their arms; this was an excellent sign! There seemed to be no one around, so I just started wandering. I came upon two sweet tweens hawking plants, flowers, and delicious lavender lemonade under a white awning. Suitably refreshed and pointed in the right direction, I continued my exploration of the property. 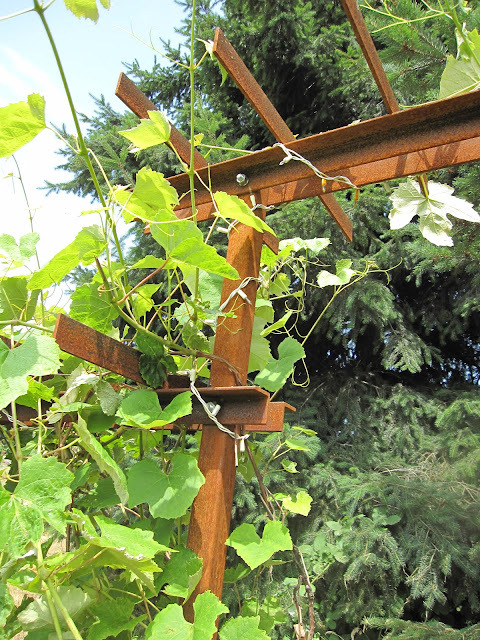 There was U-pick lavender in a field above me, but I focused on a wonderful metal arbor structure supporting a young grape vine. I think what appealed to me was simplicity and strength in the same piece. And the rust. I could almost imagine being able to build this. Tufts of grasses had plenty of room to flourish along the road. The deer-proof vegetable garden up near the greenhouse was fenced with more beautifully simple rusty metal. Inside the fenced garden, terraced beds held herbs, flowers and vegetables. This fun metal sun held a clematis on the fenced garden. 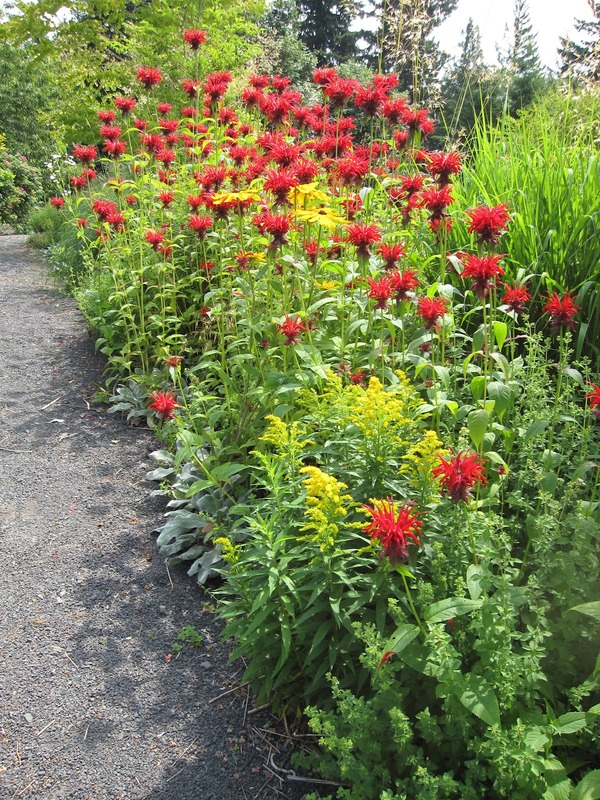 Monarda is typical of the billowy plantings throughout a lot of the property. 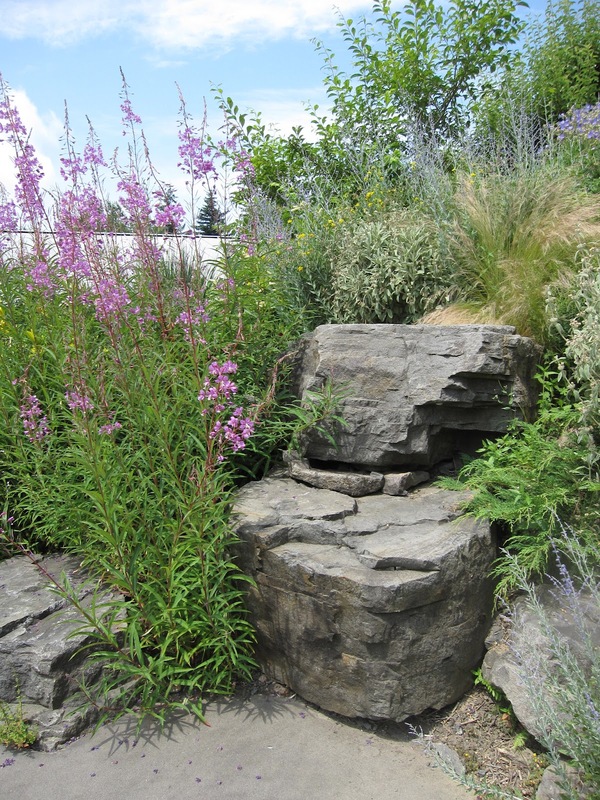 The nice use of a limited plant palette pulled the design together over the large lot. 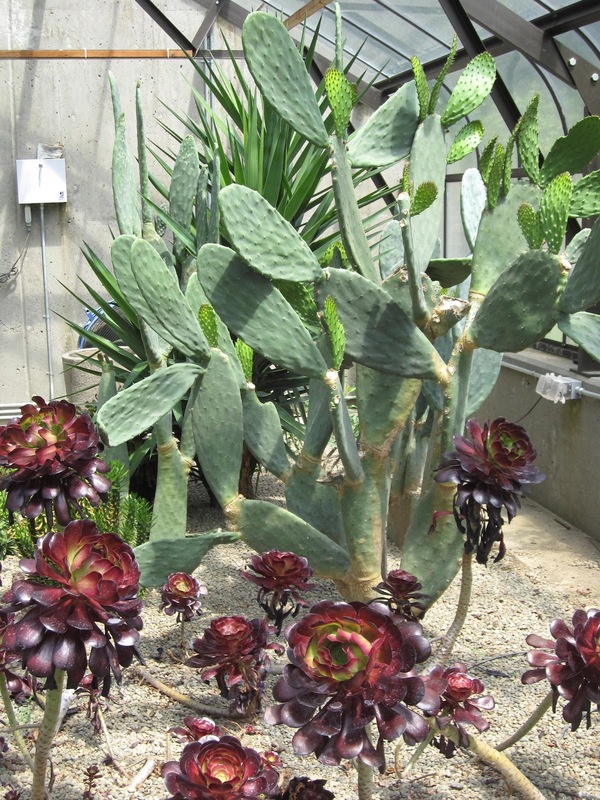 At the highest point on the property stood a large and beautiful greenhouse, flanked by citrus trees. 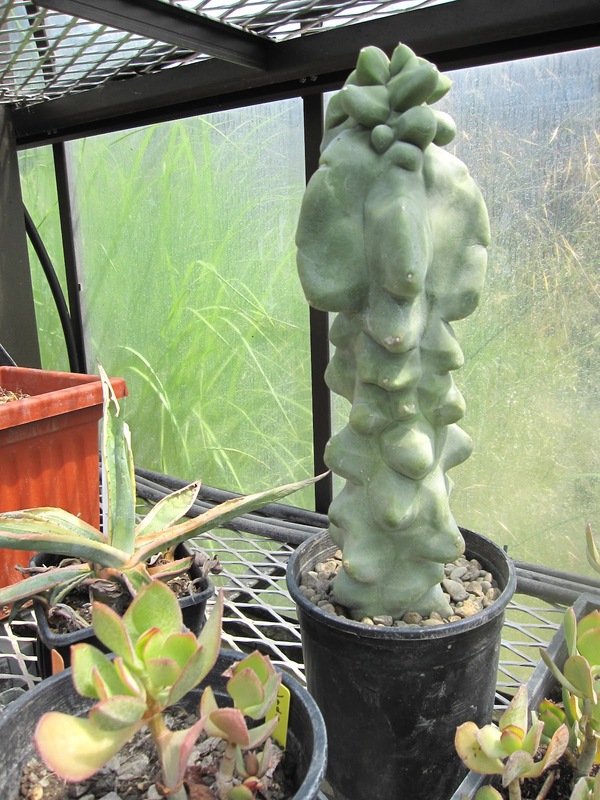 And this crazy knobbly succulent. In front of the Aeonium forest was some kind of Senecio (I think). Many of the specimens were planted right into the ground and mulched with rocks. Others were still in nursery pots or had been replanted in decorative containers. 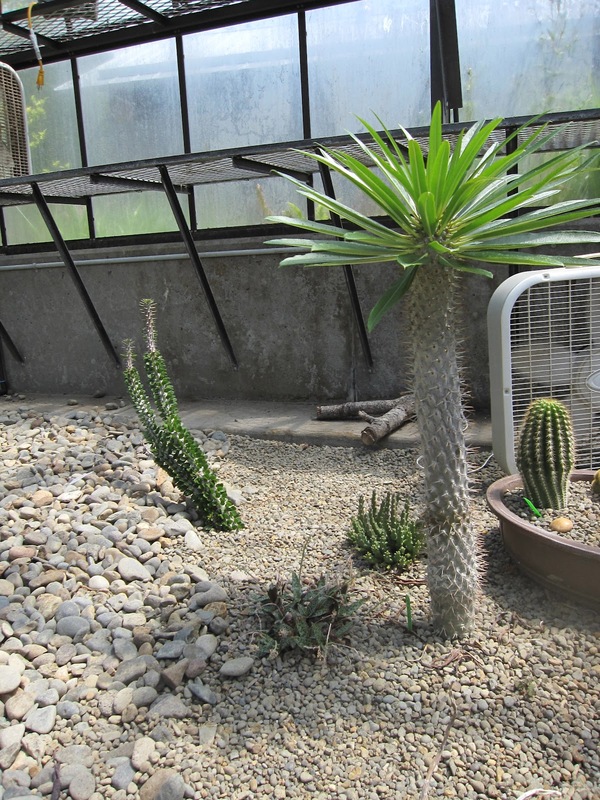 One side of the greenhouse was filled with a jungle of large species. I recognized a huge abutilon, a palm, a strelitzia and a big citrus in bloom. This unknown plant was big, and its furry flower buds were small but vivid. Tearing myself away from the greenhouse, I descended big stone steps toward the house level, accompanied by the sound of an almost-hidden watercourse. Simple drifts of lambs ears and purple thyme softened the steps. Day lilies and grasses melded together in lovely harmony. Massive boulders might have been here forever...or so artfully added they just looked like it. Reaching the house level, I looked up to a sea of heathers and poppies. The. Best. Yoga. Studio. Ever. 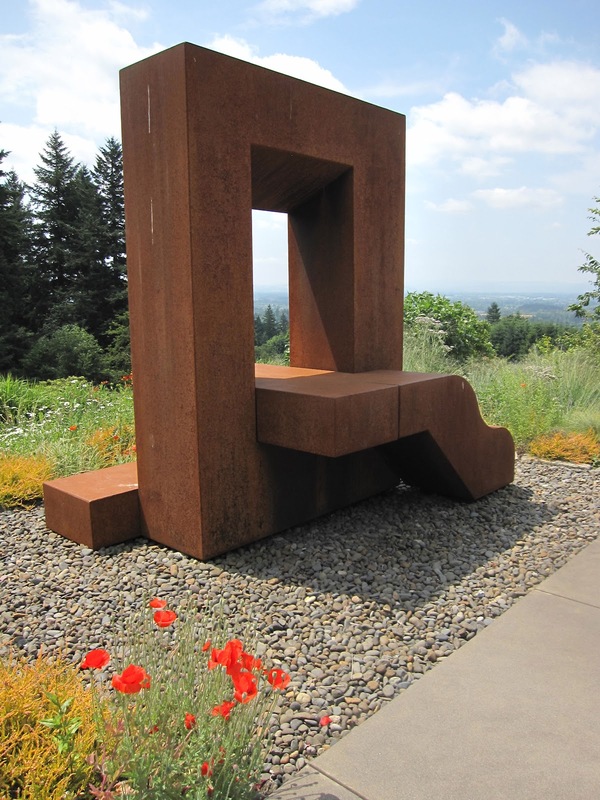 I'd be a devout practitioner too, if I had a view like this of the Tualatin Valley. A close-up of the sculpture. A look back at the yoga-studio-to-die-for. Up close to the house and recording studio, the plantings were more refined. 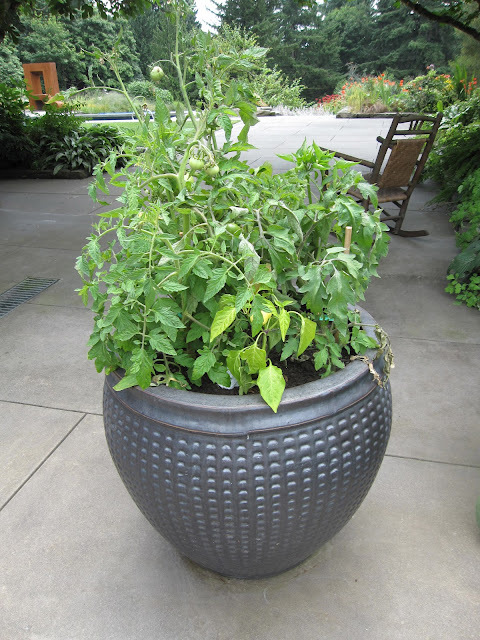 I don't think I have ever seen a more elegant tomato pot. Near the house I met the garden owner, Maryellen, who was warm and welcoming. She mentioned that they were preparing to create an extensive meadow area and that their garden wouldn't be open for the next two years as a result. That made me doubly glad I'd made the trip this year. I bought a couple of succulents from the cute kids, and it was time to go. After the visit, I was curious about the property and checked out the website for Westwind Farm Studio. The property has multifaceted uses, including a recording studio, growing sustainable plants and U-pick lavender, and as a video and still photography location. How nice of the McCullochs to also welcome HPSO members! Summer's finally in full swing here in Portland! Here's a color wheel look at what's blooming at Longview Ranch this month.